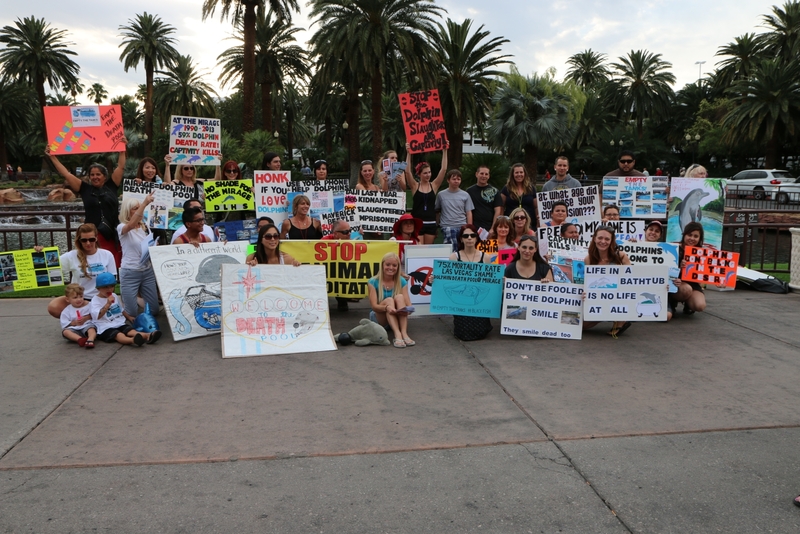 Free the Mojave Dolphins is a grass roots public awareness campaign started in January 2013. The movement began in Southern California, and we are now based out of Las Vegas, NV. We hold protests several times a year outside of the Mirage on Las Vegas Blvd, handing out leaflets to tourists and locals. We document the condition of the dolphins from inside the facility. We do not expect these dolphins to be dumped into the sea and forgotten about. We realize that the vast majority of the Mojave Dolphins have been born into captivity and may not do well in the open ocean. We are working towards phasing out the dolphin show in Las Vegas by creating a bill to prevent the import and breeding of cetaceans within the state of Nevada. We also want the USDA/APHIS to enforce the Animal Welfare Act and provide these dolphins with the care they are entitled to by law. It currently costs over $100 every time we hold protests. The money goes towards printing off brochures used to educate the public. If you would like to donate, message us. You can also help us out by purchasing items from our Amazon Wishlist.